Traveling west on US Alternate 58 through Norton and Big Stone Gap in Lee County, you experience coal country first hand. Its signs are evident everywhere. 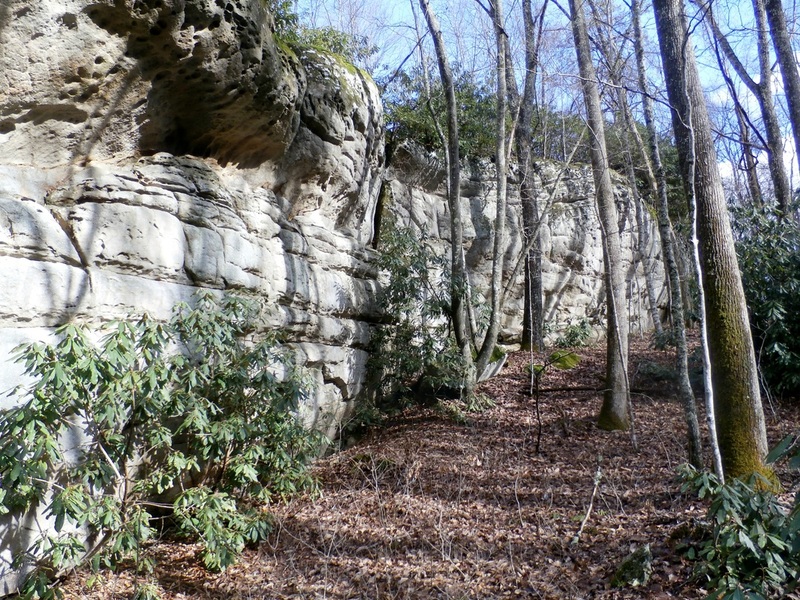 However, beyond Big Stone Gap, the long ridge of Stone Mountain is untouched by the work of mining because it is a part of the Clinch Ranger District of the Jefferson National Forest. 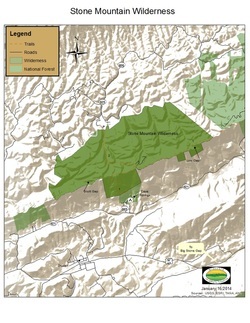 Stone Mountain Wilderness, just east of Pennington Gap near the western end of the mountain permanently protects 3270 acres. The steep south-facing scarp of Stone Mountain with its tremendous cliffs provides an outstanding view of Powell Mountain across the Powell River from an elevation of 3060 feet at the old Olinger Fire Tower site. The Powell River is famous for its rich community of freshwater mussels. In contrast, northwest of the scarp there is a more gradual descent. Here four small streams Low Gap Branch, Flanary Branch, McConnell Branch, and Payne Branch, with springs and seeps near the ridge crest flow north to the North Fork of the Powell River. Laurel Branch drains the western portion of Stone Mountain Wilderness and unlike the other streams flows west to its junction with the North Fork. The slopes of Stone Mountain are forested with Tulip Poplar, Red Maple, Black Cherry, Yellow Birch, Frazier Magnolia and several species of oak. In addition, it is possible to see an occasional holly tree with its distinctive red berries and prickly leaves. Also, because this part of southwest Virginia receives an abundance of rainfall, an average of over fifty inches per year, the foliage is lush and green. Rhododendron stands, too thick to navigate, produce brilliant pink and purple flowers in the late spring. The mussels of the Powell River are only one of the many treasures known to thrive in the area. Two rare salamanders make their home within the Stone Mountain Wilderness. While hiking there recently, I flushed a dozen grouse, a species known to enjoy early succession habitat as well. Just south of the wilderness is the Cave Springs Recreation Area, and the trailhead for the Stone Mountain Trail. There is a $3.00 fee for day use. The map of Stone Mountain shows two trails. 1) Stone Mountain Trail—14.3 miles (one way) to the Roaring Branch Trailhead on Route 58 Alternate between Appalachia and Big Stone Gap. Roaring Branch is outside the wilderness boundary. 2) Payne Branch Trail—1.8 miles (one way) climbs from the North Fork of the Powell River to the summit of Stone Mountain near the old Olinger Fire Tower Site. 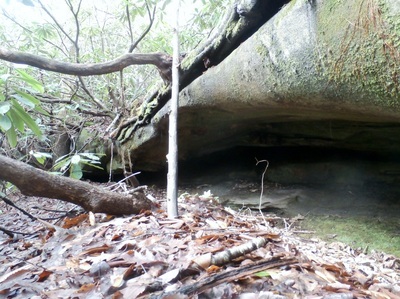 The Stone Mountain Wilderness was established by the Ridge and Valley Act of 2009. While advocates of wilderness protection sought to provide lasting protection, it was not until the Forest Supervisor intervened, that the area was recommended for wilderness in the Revised Management Plan for the Jefferson National Forest. A part of this decision rested on the fact that there were no outstanding mineral rights, a rarity on the Clinch District. The real reason was its remoteness and outstanding geological features. 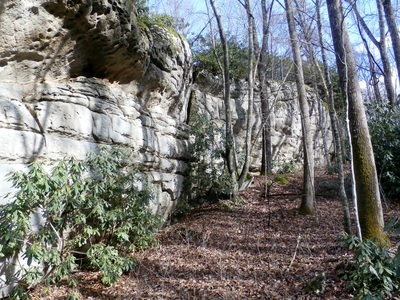 Moreover, it is one of the least disturbed forests in all of southwest Virginia.